At ProSource® of Buffalo, we know the bathroom is one of the most high-traffic rooms in a home. That makes it the perfect room for a truly personalized remodel. Our goal is to provide the right products to turn bathrooms into a luxurious spa getaway. Our broad collection of bathroom sinks will allow you to choose one that fits any preference. Whether you’re looking for a basic sink model or you want a more glamorous sink, the variety of pedestal, shroud, vessel and standard style sinks can fit into any home’s interior design. A sink faucet may seem like a tiny detail in a bathroom, but it’s something that can make a big difference in the overall design of the room. 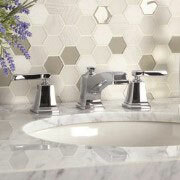 At ProSource, our bathroom sink faucets vary in color, and they are available in different handle and material types. The shower is a place to clean, relax and think, so giving it some extra attention during a remodel will provide happiness in the long run. At ProSource, we provide many different kinds of shower products such as shower heads, handles and doors and bases. 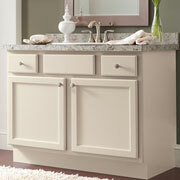 Our vanity selection highlights their storage and counter space perks. 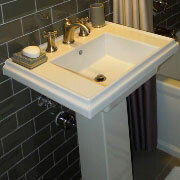 Various colors and sizes can seamlessly mix with any bathroom design. Let our team help you find something functional and stylish. 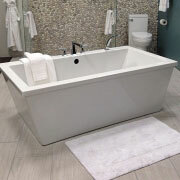 At ProSource, we offer tubs made out of fiberglass, marble, porcelain and more. Our team will help you find a tub that best suits your updated bathroom. 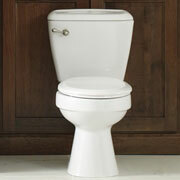 The toilet should be a primary focus when you tackle a bathroom remodel. We offer toilets with different flushing mechanism and designs, so finding a throne that creates a feeling of royalty shouldn’t be an issue.